No general winter tire regulations. Snow chains for the drive axle must be carried in the vehicle. Use according to traffic signs and road conditions. Winter tires compulsory from November 1 to April 15. Risk of driving ban and heavy fines if you do not comply (€35 to €5,000). Trucks > 3.5 t GVW must be equipped with M+S tires on at least one drive axle with a min. tread depth of 6 mm (bias) and 5 mm (radial). Winter tires are compulsory for buses (categories M2, M3) from November 1 to March 15.
to April 15. Exceptions for public service buses apply. Use on roads covered with snow and ice. Studded tires are prohibited for vehicles > 3.5 t GVW. No general winter tire regulations. Symmetric fitting compulsory for M+S and winter tires. Snow chains only allowed on roads covered with snow and/or ice. Option 1: Tires with winter profile on the drive axle with min. 4 mm tread depth. Option 2: Tires with standard profile with min. 4 mm tread depth; in case of winter conditions (e.g. snow fall, freezing rain), snow chains need to be mounted on the drive axle. Snow chains must be carried in the vehicle from November 15 to April 15. A snow shovel and a bag of sand weighing between 25 kg and 50 kg must be carried in the vehicle. Studded tires prohibited. From November 15 to March 1 summer or winter tires with minimum 4 mm tread depth are mandatory. Snow chains must be carried in the vehicle from November 1 to March 31. Usage is compulsory on mountain passes when indicated by traffic signs. Studded tires prohibited. Without adequate winter equipment, may be refused or a driving ban may be issued. Winter tires compulsory from November 15 to April 15. M+S tires are compulsory on the drive axle of vehicles > 3.5 t GVW. Snow chains required for the drive axle in certain conditions (if the vehicle is equipped with SU tires). Snow chains compulsory in some regions (Lika/Gorski Kotar). Studded tires prohibited. Commercially used vehicles must carry a snow shovel. Winter tires compulsory from November 1 to March 31 depending on road conditions in winter or if indicated by "winter kit" sign. M+S tires are compulsory on the drive axle of vehicles > 3.5 t GVW with min. 6 mm tread depth. Differing traffic signs possible. Snow chains are compulsory if indicated by traffic signs on at least 2 drive wheels of vehicles with 3 or more axles. Denmark No general winter tire regulations. Snow chains allowed from November 1 to April 15. Studded tires allowed from November 1 to April 15. Studded tires should be mounted on all tires during this period. Estonia Winter tyres compulsory for vehicles < 3.5 t GVW (radial tyres with min. 3 mm tread depth) from 1 December to 1 March (also from October to April depending on weather). Heavier vehicles do not require winter tyres, but minimum tread depth of 3 mm is mandatory. Snow chains only allowed on roads covered with snow and ice. Studded tyres are prohibited for vehicles > 3.5 t GVW. Finland Vehicles > 3,5 t GVW Dec-Feb: on drive axle min. 5 mm and all other axles min. 3 mm tread depth. Winter tyres are mandatory on drive and steer axle, but not defined in the legislation. In explana-tions, winter tyres are defined as M+S. Snow chains only allowed on roads covered with snow and ice. Studded tyres are prohibited for vehicles > 3.5 t GVW. France No general winter tyre regulations. Exceptions are indicated by traffic signs. Winter equipment is mandatory for vehicles driving on roads marked with the B26 sign. Use of snow chains when indicated by traffic signs. Vehicles < 3.5 t GVW: Studded tyres allowed from first Saturday before 11 November to last Sunday of March, max. speed 90 km/h. Vehicles with studded tyres have to be labelled with a sticker. Studded tyres are prohibited for vehicles >3.5 t GVW. Germany In certain situations in winter conditions. Vehicles < 3.5 t GVW must be equipped with tires marked with the Alpine-Symbol (3PMSF) from January 1, 2018 on all axle positions. Vehicles with > 3.5 t GVW must be fitted with tires marked with the Alpine-Symbol (3PMSF) at the wheel positions of the permanently driven axles. This holds for tires produced as of January 1, 2018. M+S tires produced before January 1, 2018 are accepted as suitable winter equipment until September 30, 2024. From July 1, 2020 at the latest, tires marked with the Alpine-Symbol are also mandatory for front steer axles. Use of snow chains when indicated by traffic signs. Studded tires prohibited. Exception: Route via "Kleines Deutsches Eck“. €60 fine for unsuitable tires; €80 fine for causing obstruction of traffic due to unsuitable tires; €100 fine for causing hazardous situation due to unsuitable tires; €120 fine for causing an accident due to unsuitable tires. Plus 1 point in each case (Flensburg points system). Great Britain No general winter tire regulations. Snow chains only allowed on roads covered with snow and ice. Studded tires allowed as long as the street surface does not get damaged. Otherwise a regress is possible. Hungary No general winter tire regulations. Snow chains only allowed on roads covered with snow and ice. It may be compulsory to apply and carry snow chains under certain weather conditions (max. speed: 50 km/h). In wintry conditions, foreign vehicles may be denied access if no snow chains are carried on board. Studded tires prohibited. Iceland No winter tyre regulation yet, new technical regulation is expected. Ireland No general winter tire regulations. Snow chains only allowed when roads covered with snow and ice. Studded tires are allowed, max. speed 96/112 km/h (national road/motorway). Italy No general winter tire regulations. An anti-skid device (e.g. snow chains) must be carried in the vehicle. Winter regulation prot. RU/1580 applies only to the following vehicles categories: M1, N1 and O1. In the event of snow the local police may impose a transit prohibition on some highway sections. Kosovo No general winter tire regulations. Snow chains for the drive axle must be carried in the vehicle. Use according to traffic signs and conditions. Studded tires prohibited. Buses and trucks must carry a snow shovel. Latvia Winter tyres (M+S) compulsory for vehicles < 3.5 t GVW from 1 December to 1 March. Minimum 4 mm tread depth. Heavier vehicles do not require winter tyres, but a minimum tread depth of 3 mm is mandatory. Snow chains only allowed on roads covered with snow and ice. Studded tyres allowed between 1 October and 30 April for vehicles > 3.5 t GVW. Liechtenstein No general winter tire regulations. However, there are liability issues if unsuitable tires are used. The vehicle equipment must be suitable for the weather conditions. Snow chains allowed. Not necessary in val- leys. In the mountains, traffic signs indicate if snow chains are compulsory. Vehicles > 7.5 t GVW: Studded tires allowed from November 1 to April 30, max. speed 80 km/h. All tires should be equipped with studded tires. Vehicles with studded tires have to be labelled with a sticker. Lithuania Winter tyres compulsory for vehicles < 3.5 t GVW from 1 November to 1 April. Heavier vehicles do not require winter tyres, but a minimum tread depth of 1.6 mm is mandatory. Snow chains only allowed on roads covered with snow and ice. Studded tyres allowed between 1 November and 1 April. Luxembourg All drive axles on trucks and buses need to be equipped with winter tires (M+S suffices) during winter conditions (snow, ice, glazed frost). Snow chains only allowed on roads covered with snow and ice. Studded tires prohibited. Macedonia No general winter tire regulations. Snow chains must be carried in the vehicle from October 15 to March 15 if vehicle has only standard tires fitted. Coaches and heavy trucks must carry snow shovels. Studded tires prohibited. Montenegro Tires marked with the M+S symbol or winter tires compulsory from November to April on specific roads, specified by Ministery of Police. Min. 4 mm tread depth. Snow chains for the drive axle must be carried in the vehicle. Use according to traffic signs and conditions. Studded tires prohibited. Buses and trucks must carry a snow shovel. Netherlands No general winter tire regulations. Snow chains not allowed on public roads. Studded tires prohibited. Vehicles > 3.5 t GVW min. 5 mm tread depth compulsory between 1 November and including first Monday after Easter (South Norway) and between 16 October and including 30 April (North Norway). Mandatory use of winter tyres on all axle positions from 15 November to 31 March. 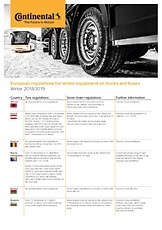 Please find a list with approved winter tyres on www.stro.no (list will be discontinued as of 1 January 2019). It is mandatory for vehicles > 3.5 t GVW to carry snow chains in the period when it is legal to use studs. A truck with trailer must carry 7 chains. Studded tyres (average protrusion: 1.7 mm) allowed from 1 November to the first Sunday after Easter. In Nordland, Troms and Finnmark: from 16 October to 30 April Trucks and trailers: studded tyres on the same axle. If twin-mounted, one tyre is sufficient. Poland No general winter tire regulations. Snow chains only allowed on roads covered with snow and ice. Adequate traffic signs on roads where snow chains are compulsory. Studded tires prohibited. Portugal No general winter tire regulations. Snow chains temporarily compulsory when indicated by traffic signs (high-altitude regions only). Studded tires prohibited. Romania In case of wintry road conditions M+S or winter tires are compulsory for the drive axle of all vehicles > 3.5 t GVW and vehicles transporting people (with more than 9 seats). Vehicles > 3.5 t GVW have to be equipped with snow chains which need to be mounted when indicated by respective traffic signs. Shovel and sand required for vehicles > 3.5 t GVW. Studded tires prohibited. Russia New Technical Regulation expected. In December, January and February, passenger, light truck, trucks and buses must be equipped on all axles with tires marked M+S or with the 3PMSF-Symbol (Three-Peak Mountain Snowflake symbol). Minimum tread depth: 4 mm Snow chains are recommended but not compulsory. Use of studded tires is forbidden in the summer months (June, July, August). Serbia Tires marked with M+S symbol or winter tires compulsory from November to April. Min. 4 mm tread depth. Use according to traffic signs and conditions. Snow chains for drive axle must be carried in the vehicle. Use according to traffic signs and conditions. Studded tires prohibited. Buses and trucks must carry a snow shovel. Slovakia Winter/M+S tires compulsory for trucks > 3.5 t GVW from November 15 to March 31 on drive axle (min. 3 mm tread depth). Snow chains must be carried in the vehicle. Use according to traffic signs and conditions. Studded tires prohibited. Option 2: standard tires, but chains must be carried in the vehicle to be mounted on the drive axle in case of winter conditions. Snow chains must be carried in vehicles > 3.5 t GVW if no winter tires are fitted. Spain High mountain roads with red level (15/TV-87): Buses can drive with tires marked with the 3PMSF symbol (Three-Peak Mountain Snowflake symbol) in all positions and minimum tread depth 4 mm. Rigid trucks between 3.5 t and 7.5 t GVW only for garbage collection, food distribution, transport of fluxes and assistance vehicles can drive with winter tires in all positions and minimum tread depth 4 mm. Other trucks not allowed to drive. High mountain roads with red level (15/TV-87): Snow chains in rigid trucks between 3.5 t and 7.5 t GVW and buses, if no winter tires are fitted. Usage of studded tires with up to 2 mm studs are allowed on snow-covered roads. In winter conditions, minimum tread depth is 5 mm on all tyres except trailer tyres. M+S marked winter tyres are compulsory on the drive axle for vehicles >3.5 t GVW from 1 December to 31 March. For a list of approved winter tyres for the drive axle please visit www.stro.se (list will be discontinued as of 1 January 2019). A change was announced for the winter tyre season 2019/20 including a switch to 3PMSF. Details to be confirmed. Snow chains recommended to be carried in the vehicle. Studded tyres are allowed from 1 October to 15 April. Depending on the weather conditions this period may be extended. Maximum of 50 studs per meter circumference in tyres produced after 1 July 2013. Please note exceptions on specific roads. Switzerland No general winter tyre regulations, regional regulations are possible in wintery road conditions (e.g. alpine passes). In case of an accident with summer tyres in wintry conditions, be aware of liability issues. Only 3PMSF tyres are considered as suitable tyres for wintry conditions. Minimum tread depth for winter tyres 1.6 mm, 4 mm is the recommended tread depth. If authorities announce mandatory snow chains, only snow chains are permitted. Use of snow chains in case of respective road signs and conditions (four-wheel drive vehicles may be excluded). Studded tyres are allowed for vehicles > 7.5 t GVW between 1 November and 30 April on snow-covered roads. Max. speed 80 km/h. Studded tyres have to be labeled with a sticker 80 km/h. It is obligatory to use winter tires for 4 months between December 1st and April 1st. Local governors decide whether to enforce winter tires regulation and make necessary announcements according to average local temperatures. It is obligatory to fit winter tires on drive axles of trucks, tractors and buses, and on all axles of light trucks, minibuses and cars. Any tire to be replaced on the road has to be replaced with a winter tire. Within the obligatory period, winter tires should bear (M+S) symbol or snowflake symbol or both on the sidewall. The tread depth and pattern of retreaded tires should comply with winter tires even if they bear (M+S) symbol on the shoulder. Winter tires should have a tread depth of min. 4 mm for trucks, tractors and buses and 1.6 mm for light trucks, minibuses and cars. Having or using a tire chain with the vehicle does not absolve drivers from their obligation to use winter tires. Only studded tires that can be used on ice can substitute winter tires. The tread depth should be measured from the tread center. Ukraine No general winter tire regulations. Snow chains only allowed on roads covered with snow and ice. Studded tires are allowed. for trucks in the following countries: Cyprus, Greece and Malta. Please consult the traffic regulations in the respective countries for special snow chain and studded tire rules. Despite careful research, we cannot guarantee that the information is correct and complete.